Psst. Martina is pressing The Detonator. Saw The Sun Of The Quince on Sunday, a two hour movie about the painter Antonio López García (and his friend Enrique Gran, a painter-ex-cartoonist). It was a tad dull, not much happened except him working on his painting of a quince tree, but I love the slowness, I love things that change my perspective even if just for the duration of a movie and a short time afterwards. A couple confirmed dates for me and conventions (also listed in the right-hand side-bar widget). i feel sorry for martina, but i also think she’s kind of retarded. her objections are valid, but at the same time, i kind of think that the eebs deserve their vengeance, and getting in the way is just making matters worse… mostly for her. not sure I understand what Martina’s pressing and what the significance of it is? Martina is pressing the detonator. Um, the eebs might deserve vengenance, but, as they stated a couple of pages ago, they’re going to do it by wiping out every single race that used eebs. As in, all of them. That’s not vengeance, or justice — that’s mass murder, and it would no doubt include anyone who tries to stop them and those with no real responsibility or power over galactic policy regarding the eebs. In short: the eebs were treated badly, but I support Martina’s decision. Things are already pretty bad for her, and she’s shown every sign of being self-sacrificing. It’s not about how good things are for her, but for life in the universe as she knows it. I have no problem with them destroying everyone who knew how Eebs were treated and yet used them anyway, but even the brain-clamped criminals who were imprisoned on the ship had pity for the Eebs once they found out how it was. They should free the criminals and let the criminals assist them in murdering the GOB members who kept the Eebs in slavery. You’ve got a double “just” in panel 4. 01/30/12 Martina Decides http://t.co/KIkC21cz sometimes i think martina is retarded. See, to make this painfully real for a moment, this is why you have things like the TRC in South Africa, the World Court rulings on ethnic cleansing in the former Yugoslavia, the Nuremberg Trials and other organs of restorative justice, to prevent everything disintegrating into civil war and endless vengeance and mass reprisals–which solve nothing. The law must be shown to stand above everyone, otherwise it’s anarchy and feuding. Sadly Martina, as a guerrilla, is already outside the law. Even though she’s right, she can’t appeal to a legal argument of redress, punishment for the guilty and justice restored. But you know what? If I were her, I’d push that detonator too! I’m thinking of so much crap that could happen next. Yay for you coming back to Mpls! I think Martina is doing the right thing. Eeb “logic” would eventually have them destroying most of civilization and brain-clamping the rest. This is a great strip in so many ways, and here I’m seeing it challenge one of my assumptions.. “The downtrodden and oppressed are noble and righteous.” The injustice of their slavery does not confer on the Eebs a moral superiority. For reals? That was your assumption? Naw, the downtrodden are a small minded, vindictive, powerhungry, inefficient, sqabbling, hateful bunch – quite like the downtreaders, really. Like most People most of the time. Another thing – Chris, you relly get the storytelling going here. I thought about this developement since the Mirrgoth-revelations, but this is a brilliant way to show the danger Eebs pose, and yet a containable situation from the strorytelling side. Off the station: Untold billions if not *trillions* of people, of which maybe a few thousand are part of the conspiracy to exploit the Eebs. The rest know nothing, but will still DIE BURNING if the Eebs get loose. Why are people convinced that pushing the button is a bad idea? People are missing an interesting point however! The eebs are quite powerful, now if even one caught wind of the station blowing up, it wouldn’t be hard for them to stop the detonation and rig the station up to get out. We are talking about creatures that are hyper intelligent have mega telekinetic capabilities and now even more homicidal. I have two questions. One, how long does that detonator take to blow up the station? It really shouldn’t leave them such getaway time. And two, assuming that it takes out Red-9 and Cornflower-94 and all the rest of the Eebs on the station, where did Red-9 leave that suitcase of Eeb DNA? 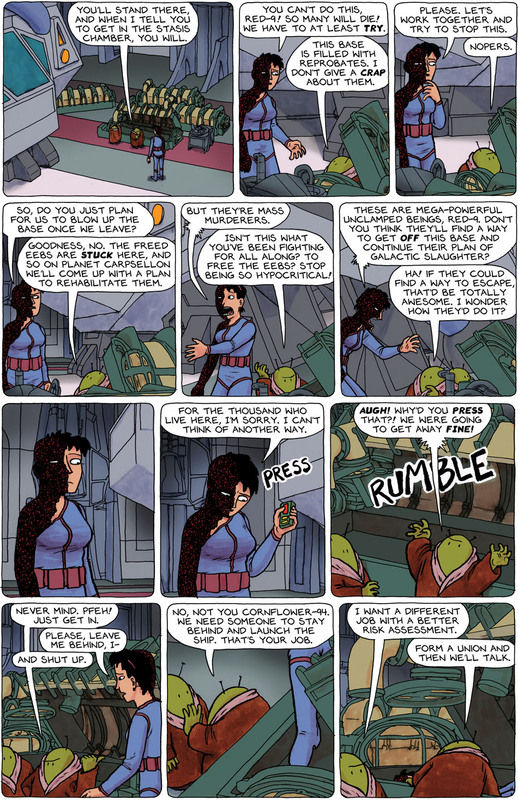 @CompaniaHill, in The Detonator strip, Red-9 explains that it destroys the spacetrawlers which protect and propel the station. The station itself will not blow up from the detonation, so it will take a wee bit of time. The suitcase was left with Dimitri & co. I’ve put that in the dialogue, and just figured the eebs were carrying it, but I’ve been considering going back in and showing it here and there because I think we need a visual cue too. Murdering everyone regardless of what they have done, or not done, isn’t any more good than what was done to the Eebs. So two wrongs do not create a right does it? Ahh Martina, if you were real I’d try to kiss you. Such self sacrificing is so hard to do but this is a far better way to go than disintegration by an Eeb madman. And in her case she is out of options. She knows that if she doesn’t act she will help Red-9 by default an that would be harder to live with than her serious burns. Just, just put a comma in between the words! The comma, she is to make a pause, a breath, a hesitation for thinking through thoughts, and expressing them wonderfully the same! English, she is such a language, yes? @Night-Gaunt, two wrongs don’t make a right, but three lefts do. I don’t think that the station will be destroyed. The Eebs who were in training to become Spacetrawlers can protect and propell the ship as the spacetrawlers did. This might keep them busy, but they might also soon realise that a little side thrust would get them out of Bograms teeth and into the more empty space where they could relax , or where they could revenge. I don’t suppose that Red -9 taught any of them Navagation? There might be a reason for the Eebs on the station to preserve at least one of the staff alive , if he is a navigator. @WellWellWell – I also used to think the oppressors were usually just misguided and, if they knew the truth, they’d do the right thing. Freed Eebs= why we haven’t heard or seen anything in reality from other alien life. Look out when we do.